But if I didn't live in a rural area, would I have similar opportunities? If I lived in my state's largest city, would I find fresh veggies and fruit, raw honey, fresh fish? If I lived in NYC or Chicago or LA, would I be able to see people work the land, producing food? Robin Shulman shares the story of food growers—people who raise vegetable gardens, fish for crabs, make beer—in the heart of New York City in her book Eat the City: A Tale of the Fishers, Foragers, Butchers, Farmers, Poultry Minders, Sugar Refiners, Cane Cutters, Bee Keepers, Wine Makers, and Brewers Who Built New York. I've always known that food is more about cooking and putting fork to mouth. Food is about the connections, the relationships built and cultivated from a love of food, the collective history of our eating patterns and the search for foodstuff. Two elements impress me about Shulman's investigative work. First, she creates a historic document about food production and manufacturing and shows how its shifted landscape through the years. Second, she opens up the city that never sleeps, making it personable and relative to anyone who enjoys bringing food to the table. We are giving away a copy of Eat the City (Crown, July 2012; hardcover 352 pages; list price $26) to one lucky reader. Just enter the Rafflecopter form below for a chance to win. Open to US and Canada. This book sounds fascinating. One of my favorite books is Pollan's "The Botany of Desire" that chronicles the rise of four particular plants. Kingsolver's nonfiction book about raising her own food for a year is also a great one. Therefore, I'm definitely intrigued by Robin's book. We shop at Soulard Market, a historically famous open air farmers' market. It's a great place to get fruit, veggies, spices, and a fabulous spot to people watch. I love buying food from local producers. Some people have such interesting stories behind how they started their business. I am a part of a local cropshare - the best food I've ever had - and so affordable! Whoever wins, reads and learns from this book is one lucky person. Anyone who makes their own food is a hero in my books. I've been trying to publish a series for kids about eating healthy and will use the lessons of this book as inspiration for BananaBoys stories. Off to add it to my wish list to increase my attraction to it. We buy from the grocery store. However, my neighbor gardens and gives us some veggies and even makes jam & gives some to us. I like to buy locally grown produce and pies from a small place down the road from me! I shop in season from my Netcong Farmer's market. There are vegetables growing in the backyard garden! Eat the City - Review and Giveaway. 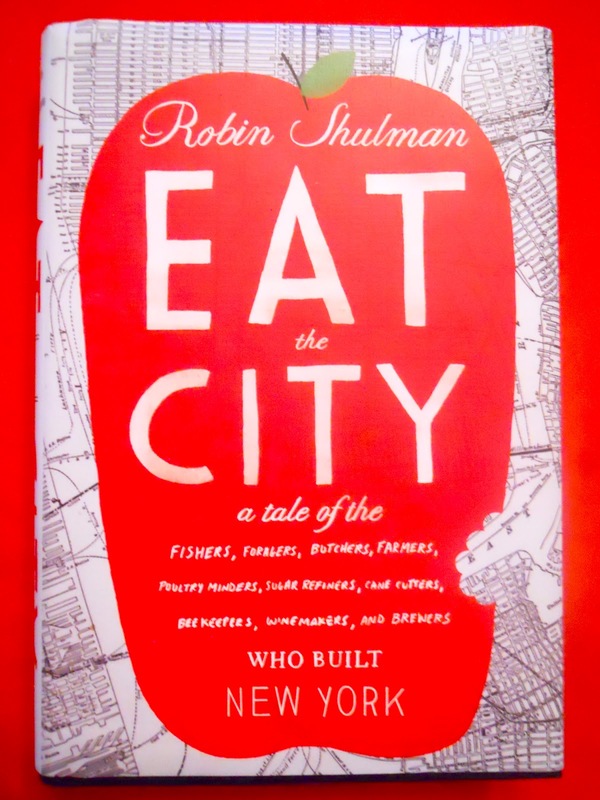 Hardcover copy of Eat the City: A Tale of the Fishers, Foragers, Butchers, Farmers, Poultry Minders, Sugar Refiners, Cane Cutters, Bee Keepers, Wine Makers, and Brewers Who Build New York by Robin Schulman. Do you buy locally produced food? Or, if you grow your own food, we'd love to hear about that! No I Don't Buy Locally Produced Food.I Live In A City In An Apartment And Since I Don't Have A Backyard I Can't Have A Garden. I Would Like To Grow My Own Vegetables Someday. I have a farmers market down the street from my house so I always buy from them its cheaper and better! I have my garden and chickens but I also buy from the co-op in town, the Thursday Farmer's Market, and the Sunday Market. This week I picked up tomatoes, blueberries, summer squash, rainbow chard, local honey, and peaches. I wish we had a farmers market near us. I'd love to shop locally! Thanks for the giveaway...we shop at a local farmers market a weekend or two each month.